Sunny started her Conformation career and her Rally Obedience career the same weekend in Perry, GA, at 6 1/2 months old. During that weekend she earned her first 2 conformation points and her Rally Novice Title! She followed up that amazing weekend with another one in Greenville, SC, at 9 months old. 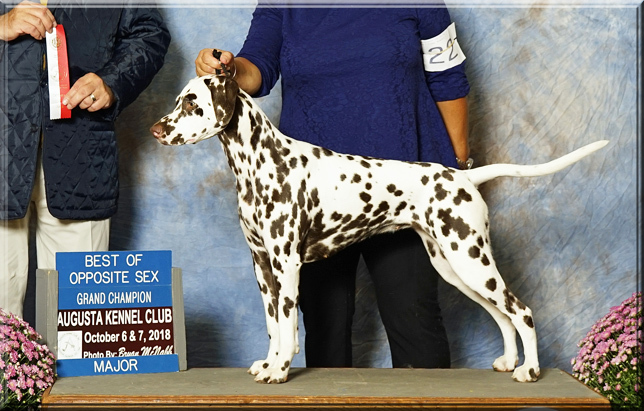 She not only earned 5 point majors at 2 shows under Judges Elliott Weiss and Joy Brewster, but also was Best in Sweeps at the Dalmatian Club of the Piedmont's Friday specialty under Judge Mary Dolde. Atlanta proved to be an even more amazing weekend for Sunny! On 8/24 at the Sawnee Mtn KC show, Sunny went BOB from the classes for 5 points to finish under Judge Dana Cline. She followed that win with a qualifying score in Rally Obedience that earned her a Rally Intermediate title. That afternoon, at the first Dalmatian Club of Greater Atlanta specialty, Sunny was BOS under Judge Tom Yates. The following day at the second DCGA specialty, Sunny was Best in Sweeps and BOS under Judge Judy Murray. The weekend of 9/22 and 9/23, Sunny earned a Select under Judge Carolyn Alexander, and a BOS under Judge Tim Catterson at the Anniston KC shows in Lincoln, AL. Sunny showed with 2 of her siblings at the Augusta, GA KC shows 10/6 and 10/7. She was Select on 10/6 under Judge Joy Brewster, and BOS 10/7 under Judge Michael Canalizo, to finish her Grand Championship at 11 months old! Sunny has also completed her International KC Championship, taking a BIS! Sunny is owned by Karen West, and co-owned by her breeder Pam Fisher. We have high hopes for this pretty liver girl.